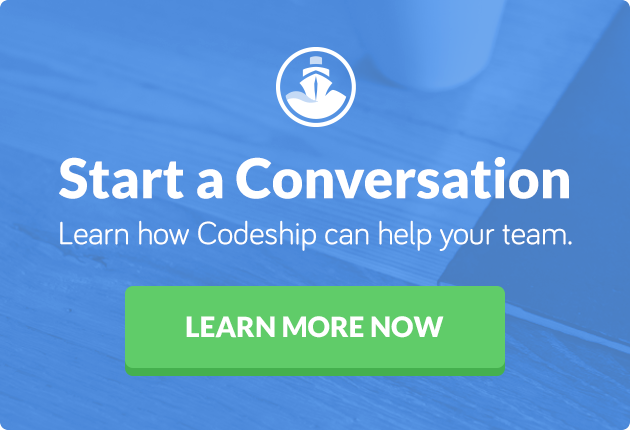 We are super excited to announce that Codeship has closed a new round of funding over $7 million. In addition, Luke Burns from Ascent Venture Partners will join our board of directors, helping us to build Codeship at an even faster pace. Being able to raise additional money is certainly an amazing milestone for us as a team, but what’s even more critical for us is why we were able to do it and why we did it. The ‘why’ is by far more important to us and should give some insight in how we think and operate. First, I want to take the chance to thank all of you who have helped us over the last five years. Codeship would not exist without the support we’ve received. Building a product is difficult and becomes impossible without your constant feedback. Thank you! Although Codeship has been in operation for five years, we feel that we are still right at the beginning of our journey. Codeship’s vision is to build for the builders. We want to empower software engineers and product teams to craft beautiful things for their users. We believe continuous integration and delivery are essential practices for an efficient software development workflow. These are concepts that have changed how software development teams work together in how they create new software and new applications. They’re about how to deliver value to your users and how to get your code out there to get it used by others. Doing all that at scale can be hard. At Codeship, we understand the complexity of the technical challenges, and we’re striving for simple but powerful solutions. We want to give you full control and supportability of your team workflows and processes. We want to enable your engineering organization to release code quickly and frequently. Fulfilling this promise is what gets us out of bed every morning and was a large factor in raising more capital. We want to be able to improve our product for all of you — raising outside capital is what will allow us to do this as quickly as possible. Just as important as building the product and the technology is sharing all the knowledge we’ve gained while doing so. Almost exactly five years ago, we published our very first blog post, and 392 posts later, our thinking has evolved a bit. It’s no longer just the Codeship team sharing and writing tutorials. Thanks to our community, we have blog posts authored by more than 60 different contributors. Some of our most well-received posts, like “Unleash the Power of Storing JSON in Postgres” or “Container OS Comparison,” are not written by our team but by people from our community. We’re truly excited to continue building our blog and sharing all the things we learned with an even larger audience. If you want to contribute, just let us know or join our community forum. Like we said earlier, we still think that our journey has only just begun, even though we’ve been here for five years now. We’re even more excited about the next five! One of the great advantages of having raised more money is that we can build out our team faster than we could have otherwise. If you are as excited about building developer tools as we are, please reach out to us.